Finn’s summer vacation plans didn’t include leaving the planet. If your young reader likes action and adventure they will enjoy Finn’s Rocket. Although, I was slightly confused about the appropriate age group, I believe this is a good fit for a middle grader. It’s packed full of interesting characters, suspense, surfing, space, science and more. I love the relationship between Finn and his sister, they’re both smart and brave with a sense of humor. The family’s life style may be a little bit out of this world, but that’s ok, that’s what reading is for, to escape, imagine and dream. First published in Brooklyn in third grade, Serena Schreiber took a circuitous route through Europe to settle in Florida. When not writing for kids or scientists, she follows her other muse, fantasy. She’s a happy co-conspirator of Florida Writers Association Youth Program and runs the Howl at the Moon Writers Jam. Serena has two amazing children, a handsome husband, and a turtle named Bolt. In a follow up to last week’s post “Scary Bedtime Stories – If You Dare” which was geared toward younger readers, this week’s scary bedtime stories are for middle grade readers. These are spooky, scary, magical and mysterious – your middle grader may want to sleep with the lights on. Again, jump up on a comfy mattress, get a blanket to cover yourself up, a flashlight and maybe a teddy bear or something else to cuddle, and start reading. This book is a little older, written in 1986 but it still packs a punch for scary. Molly and her brother Michael have a step-sister, Heather, that they don’t really like and with good reason. She has made their lives miserable ever since their parents got married. And, to make life worse for Molly and Michael, they’ve moved to a new house in the country. The new house, just happens to be an old church and has a cemetery in the back yard. Spooky enough already. But, the story really gets creepy when Heather starts talking to a ghost named Helen and she starts warning Molly and Michael that Helen is coming for them. 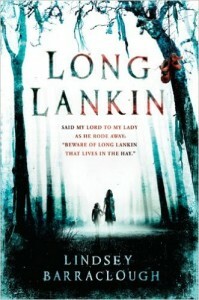 Dark secrets, ghosts, graves and a creepy step-sister will keep you scared through-out the entire book. One of my favorites! 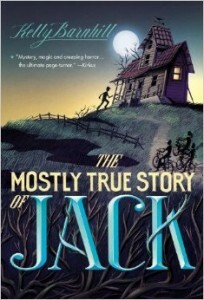 Jack is sent away to live in Hazelwood, Iowa with his aunt and uncle, who are very STRANGE. Jack doesn’t expect much for his summer, except a boredom because usually he goes unnoticed, like he’s invisible. Little does he know, the town of Hazelwood has been waiting for him for a long time. Creeped out yet? Almost immediately upon arrival he makes three new friends, who just happen to be imaginary. 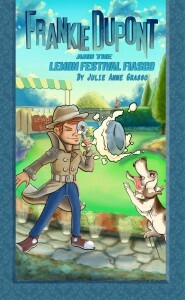 Jack also becomes the the center of attention to the town bully and the richest man in town who want Jack gone. Don’t be fooled, this book is chocked full of suspense, twists and turns, magic and deeply rooted secrets. I don’t want to give too much away, but look close at the cover, the creepy house, the tentacle like roots and Jack’s three friends following him on bikes. This one comes from the other side of the pond, Great Britain, and takes place during WWII. I like to call this a good old fashioned horror tale, it will keep you up at night. Cora and her younger sister, Mimi, are sent to stay with their elderly aunt in the isolated village of Byers Guerdo. Auntie Ida is rigid and unfriendly. The girls want nothing to do with Auntie Ida and the village, they want to go home to London. The reason they were sent to live with Aunt Ida to live, is to keep them safe from the bombs being dropped all over London. But living in the isolated village with Aunt Ida is a fate which is worse than being back in London. The sisters soon discover the evil curse and that their aunt’s life which was devastated the last time two young sisters were at Guerdon Hall. Cora makes friends with Roger and Peter, two village boys, and together they uncover the horrifying truth that has held Bryers Guerdon in its dark grip for centuries. Little do they know the curse is about to come full circle and it’s up to the group of friends to put a stop to it. I think these three selections are enough to keep any middle grader scared and riveted at the same time. Just make sure you have plenty of room in your bed when they come running from the nightmares. Mother Daughter Book Reviews is pleased to be hosting a Book Blast showing off the new covers of the “Princess Madeline Trilogy”by Kirstin Pulioff. Summary: What would you do if you were sitting on a park bench, minding your own business, and one of those annoying pigeons suddenly started to talk to you? And what if the pigeon didn’t just talk to you – in a meticulous British accent, no less – but pleaded with you to help untangle a piece of string that had accidentally attached his leg to a wrought iron fence surrounding the playground? And what if, while you are still convinced that this is all a big nasty trick, a hawk swoops down out of the sky and starts cursing at you, also in the King’s English, for getting in his way when he wanted to execute the pigeon? 1: As succinctly as possible, tell us why someone should read your book. Ken: Because otherwise we’ll burn your house down and make you cry! Anne: I think that may be the wrong approach. Ken: It works for the Mafia. Anne: Let’s tell them about the great characters they are going to meet—the surprising things that the reader will learn about the characters and that the characters will learn about each other and about themselves and about friendship and love and loyalty. Ken: They may still cry. I cry when I read about Mr. Bags. Anne: I’m going to try not to cry at the next question. 2: What is YOUR favorite part of the book? Anne. Wait! First you have to tell them that Whitehair is actually a man who was turned into a pigeon 160 years ago when he recited a magic spell incorrectly. Anne: Couldn’t we talk about something that is a little less infantile than pigeons doing their business on a few bullies? Ken: We could. But it wouldn’t be my favorite part. 3: What is the main message you want to convey to your readers in your books? Ken: Pigeons are God’s creatures too. Feed them once in a while! Anne: That would be Whitehair’s message, Ken. He’s the one who’s always hungry. The message we are trying to convey is about friendship and love and the effects of those uplifting emotions on the lives of the characters. Ken: But people should still feed the pigeons, right. One of them might be Whitehair. Anne: Right… I think I’ll handle the next question. 4: Can we expect more books from you in the future? Ken: Are you kidding. We have one in our brains right now and it’s kind of annoying because this plot involves an actual battle with cannon and muskets and so the scenes are very loud inside my head— Ouch! Why did you kick me? Anne: We are indeed working on a sequel involving Jenny and James, Sleepy and Katylyn, and of course, Whitehair the person turned into a pigeon. They will be traveling back to the Revolutionary War, trying not to do something that will change the course of history in unforeseen ways. Ken: That’s very deep, Anne. Wow. Change the course of history…. 5: What has been the best compliment you received as an author? Anne: Ken, I don’t think that was meant as a compliment. Ken: From her it was a compliment. Anne: What about when people say that our characters seem like real people, or that they cried or laughed when certain things happened, or that they are looking forward to reading the sequel, or that the book stayed with them well after they were done reading. Ken: I’ve got to remember all that stuff when I see my fourth grade teacher again. 6: How do you react to a bad review? Ken: Another easy one. When we get a bad review, we look up the person on the internet and burn their house down. Anne: We do not! Why are you saying these things. Ken: (Whispering) Just in case. You never know who might be reading this. Anne: Yes, because if the reviewer is right and our book really is bad, then we deserve the negative comments and, anyway, we’ll be getting a lot more bad reviews. But, if the book is good, one bad review won’t make a difference. You see, in the end it doesn’t matter. Ken: You are so wise, Anne. Were you this wise when I married you? 7: What is the best advice you received as an author? Ken: This is another one that I’ll ace. Again, it was my fourth grade teacher. She said, “What in the world makes you think you can write a book?” And then she started laughing. Anne: How was that good advice? Ken: Because, just to prove her wrong, I sat down with my wonderful wife and wrote a book. And then we wrote another one and another and…. How many have we written now? Anne: A lot , Ken. And that is a very sweet thing for you to say. But don’t you think the best advice was not to give up? To keep working? To rewrite and rewrite again until you can read it aloud and feel as though someone else wrote it? Ken: True. But it is a little creepy when the book is so polished that it seems someone else wrote it. I mean, what if someone else really did write it? Anne: (Sighing again). Are there many more questions?. 8: What advice would you give someone aspiring to write a children’s book? Anne: Why would you say that? Ken: (Whispering again) Because there’s enough competition already. Anne: But do you want to deprive anyone of the pleasure of writing a book for children. Do you remember how much fun it was when our own daughter read the chapters as we were writing them. Ken: It was the best, Anne. Anne: So I think we should tell people to find a child of the appropriate age and write it for that person as if he or she is listening. Ken: And if they walk away in the middle, give it up! Anne: No! Keep writing and rewriting until you get it right! Ken: You give the best advice, Anne. Will you marry me? Anne: We are married, Ken. Ken: I know. But if we get divorced, will you marry me? Anne: That really doesn’t make sense. Ken: It sounded kind of romantic in my head. But, you know, with all that musket and cannon fire, it’s hard to always tell. Ken: Goodbye listeners, and don’t forget to pay the fire insurance. When Anne Rothman was a student at Bryn Mawr College and Kenneth Hicks was a student at Haverford College, they began writing together in an independent-study course with one of Ken’s professors. A brief interlude ensued while Anne wrote wonderful poetry and Ken wrote a book about hitchhiking (The Complete Hitchhiker Tobey Publishing, Dell Distribution), but they soon got back together as writers when Ken was in law school at Columbia University and Anne was paying the rent by working in publishing. They have continued to write together for about forty years and in that time have published four adult novels, eleven non-fiction books for children, two fiction books for middle readers, and two photography books. They also produced three children whom they love even more than writing. Their most recent middle reader book is Things Are Not What they Seem, published by the MuseItYoung division of MuseItUp Publishing, and available in all formats. Their three latest adult novels are Kate and the Kid, a mainstream novel, Mind me, Milady, a mystery thriller, and Praise Her, Praise Diana, a thriller. Between projects, they started a web site www.randh71productions.com. In case you were wondering about the address, “R” is for Rothman, “H” is for Hicks, and “71” is the year of their marriage. No secret codes or numerology anywhere. Terms and Conditions: NO PURCHASE NECESSARY TO ENTER OR WIN. VOID WHERE PROHIBITED BY LAW. A winner will be randomly drawn through the Rafflecopter widget and will be contacted by email within 48 hours after the giveaway ends. The winner will then have 72 hours to respond. If the winner does not respond within 72 hours, a new draw will take place for a new winner. Odds of winning will vary depending on the number of eligible entries received. This contest is in no way sponsored, endorsed or administered by, or associated with Facebook. This giveaway is sponsored by Anne Rothman-Hicks and Kenneth Hicks and is hosted and managed by Renee from Mother Daughter Book Reviews. If you have any additional questions – feel free to send and email to Renee(at)MotherDaughterBookReviews(dot)com.